Garbage: Wastes resulting from the handling, processing, cooking and consumption of food. Refuse: Combustible trash, including, but not limited to, paper cartons, boxes, barrels, wood, and bedding; and non-combustible trash, including, but not limited to, metals and crockery. Refuse does not include earth and wastes from construction or remodeling projects, hazardous substances, hazardous waste, special waste as defined by the Illinois Environmental Protection Act (“IEPA”), nor shall it include any waste resulting from industrial processes and manufacturing operations such as food processing wastes, lumber, electronic waste (“E-Waste”) or any waste that the IEPA does not allow to be deposited into an IEPA permitted landfill facility. Yard Waste: All accumulations of grass or shrubbery cuttings, leaves, tree limbs, and other materials accumulated as a result of the care of lawns, shrubbery, and vines. Tree limbs shall not exceed three (3) inches in diameter or three (3) feet in length. Residential Waste: Garbage, Refuse, and other general household waste. E-Waste: Any electronic item that is prohibited from being disposed of into an IEPA approved landfill facility. White Goods: Household appliances, including refrigerators, freezers, air conditioners, dehumidifiers, hot water heaters containing mercury switches, any item containing CFC refrigerants, or any other similar item that is prohibited from being disposed of into an IEPA landfill facility. The collection of White Goods by Contractor is not included in this Agreement. Bulk Items: Household items such as chairs, tables, beds, mattresses and other items of similar nature which are too large to fit inside Contractor supplied garbage cart. Construction and remodeling debris are specifically excluded from the definition of Bulk Items. Bulk Items exclude any item which is prohibited from being disposed of into an IEPA approved landfill facility. Recycling: Newspapers, corrugated cardboard, glass, metal cans (including aluminum or tin), plastic bottles designated as number 1-7 under the Plastic Recycling Code, paper products, including envelopes, copy paper, magazines, junk mail, manila folders, and other such materials as the parties may agree to in writing. 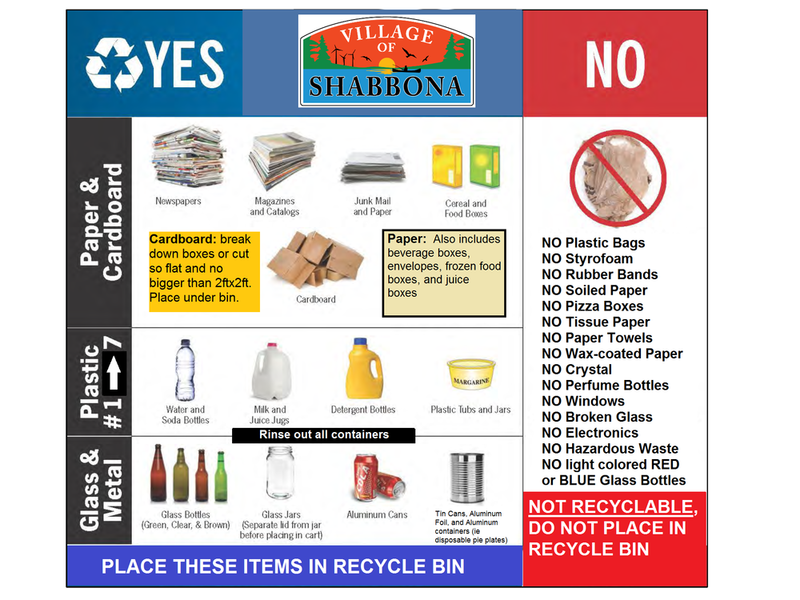 All Recycling Materials placed for collection shall be owned by and are the responsibility of the Residential Property Owner and/or the Village until the materials are collected by Contractor. Once collected, any and all right, title and interest in said Recycling Materials that each Residential Property Owner and/or the Village held thereby transfers immediately to Contractor who becomes the sole owner of said Recycling Materials. Upon collection of the Recycling Materials, Contractor is responsible for transporting, processing, and disposing of collected Recycling Materials.